Celtic fae, the Sidhe, are not small, European fairies, but tall and handsome, much like high elves. They inhabited the six Celtic nations (Brittany, Cornwall, Wales, Scotland, Ireland, and the Isle of Mann). When their land was invaded by the Milesians, the Sidhe were defeated at the great battle of Tailltin. In the end, they established a parallel realm beneath the earth. The Sidhe coexist invisibly with the world of humans and are generally benign, unless angered. They do like offerings, with milk being their favorite. Many trees and mounds, or sidhes fall under their protection, and should a mortal harm them, a curse is put upon him and his descendants. Home and roads are not build to cross the ley-lines, the underground fairy paths, lest strange things happen. When a host of the Sidhe pass by, you hear a strange sound, like the humming of a thousand bees. 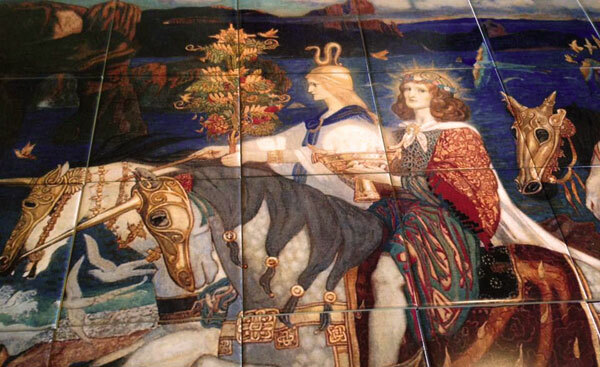 This tile backsplash is based on Riders of the Sidhe by John Duncan	(1911). Experiences of the Sidhe may be accompanied by other sonorous phenomena. not just bees; Duncan heard 'fairy music' while painting. 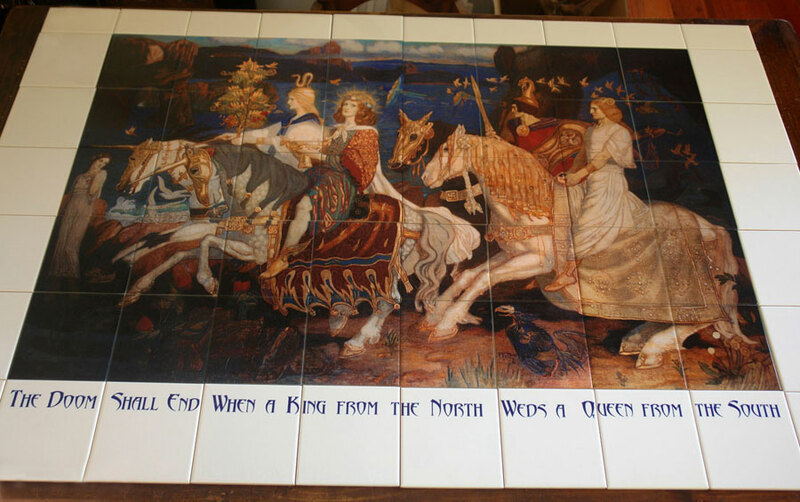 Duncan was influenced by the Pre-Raphaelites and the Symbolist movement. 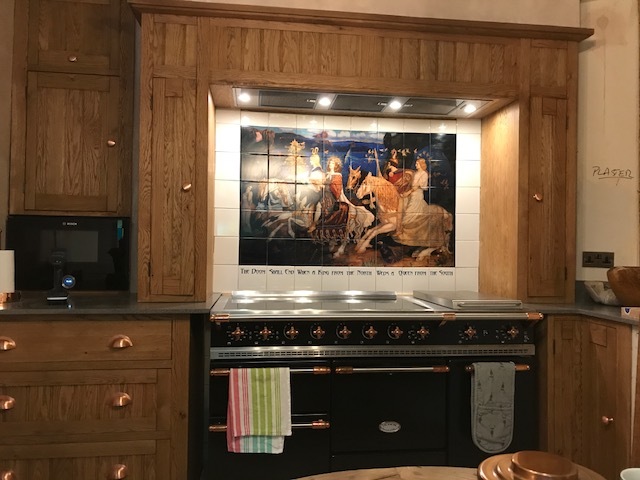 I've listed him with Scottish Arts & Crafts, Jessie M. King, Charles Rennie Macintosh, and Phoebe Traquair, but he's most known for his role in the Scottish Celtic Revival. Colors: Can be modified slightly. See How to Order Tile. Availability: Riders takes a bit longer because of all the detailed matching required. Allow 4-6 weeks.